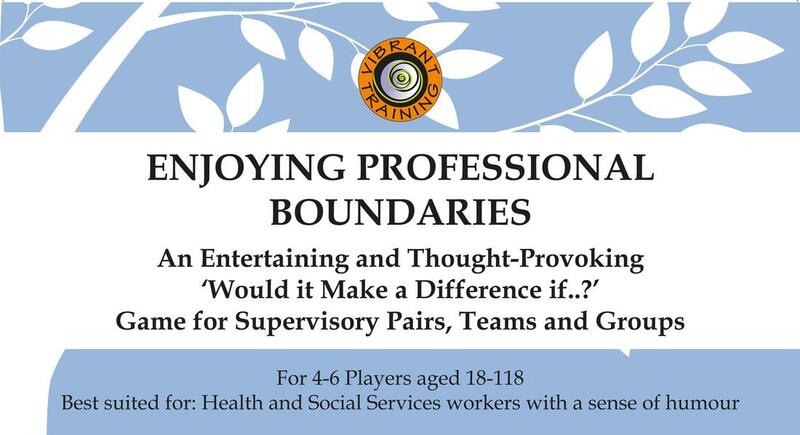 Transform your thinking about professional boundaries! Sharing curiosity, rather than anxiety, around professional boundaries. Professional Boundaries keep us and our clients safe, but often present us with dilemmas, which rarely have black and white answers. We often make professional boundary decisions instinctively. This game will help develop your ability to consider, and discuss, the thinking behind your decisions, in a light-hearted and enjoyable way. The game is played in groups of up to 4 people. The Blue version is sufficient for up to 12 people to play at once. If there are more than 12 people are in your team, purchase both the Blue and the Orange versions. Full instructions are provided in each box and again in each set of cards. Each box contains 3 sets of 5 cards showing worker/client scenarios. One player places the cards in the order they think acceptable to unacceptable. Other group members ask “Would it make a difference if..?” questions, which may cause changes in the order of the cards. ​Interesting, lively, and often hilarious, discussions ensue! Similar to the blue and orange versions, but contains scenarios that supervisors may face with their supervisees. To order and pay now by credit card, click on the "Store" button at the top of this page. Please contact us if you have not received acknowledgement of your order within 3 business days. Your order will be shipped once payment has been confirmed.